Back by popular request! Magnetic, easy-going and delightfully articulate, Canadian pianist Ian Parker captivates audiences wherever he goes. 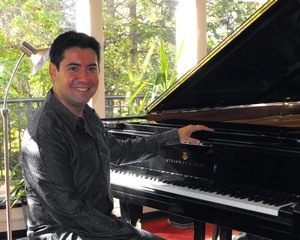 An enthusiastic recitalist, Ian has performed across the United States, Western Europe, Israel, and throughout Canada on tours with Debut Atlantic and Jeunesses Musicales du Canada. He made his Lincoln Center recital debut at the Walter Reade Theater in 2004, and recorded a CD with the London Symphony Orchestra under Michael Francis (Ravel Concerto in G, Stravinsky Capriccio, and Gershwin Concerto in F) which was released by ATMA Classique in 2010. For part of this concert Ian will be joined by Colleen Venables, a talented young violinist from Armstrong, BC. Colleen has won many 1st prizes at BC Performing Arts Festivals and took 1st prize at the 2012 Canadian National Music Festival. She has worked with artists from around the world – such as Pinchas Zukerman, Leonidas Kavakos, Andres Cardenes, Ian Swensen, Tong Wei-Dong, Tadeusz Gadzina, Nicola Benedetti, Gerardo Ribeiro, members of Shanghai Quartet, members of Miro Quartet and pianist, Ian Parker. She enjoys dancing, singing, improvising and any form of art that allows her to express and share with other people. Here’s a little “teaser” of Ian’s playing for you to enjoy!